WAIST HIGH: Debora Iyall Returns With Stay Strong. Debora Iyall Returns With Stay Strong. I can still remember clearly the first time I heard Debora Iyall's voice; me, a nubile 16 year old cruising through the streets of Arcadia, California, experiencing momentary bliss as I had somehow been given temporary control of the family's car radio. Onto KROQ came Romeo Void's "A Girl in Trouble (Is a Temporary Thing)," and I knew it then; this was the kind of music I wanted to listen to forever. This was the kind of music I knew I was not going to be able to live without. One of the most extraordinary things I have found over the course of this six-year-old blog has been the discovery of the overwhelming power that music had on my emotions as a teenager. And it seems now that this blog has let me sort it all out. I spoke about music's profound ability to imprint a precise set of emotions in our memory banks in a love letter I wrote to the song "Belly of the Whale." We absolutely remember our state of mind, the sights, the smells, the time, the place, and the feelings we were experiencing when we first heard a great song. Those imprints can and do change how you feel about music forever, and for me, "A Girl in Trouble (Is a Temporary Thing)," is one those such songs. Songs that with just one quick listen have the power to bring it all back. I then went on to discover "I Mean It," "Just Too Easy," and "Never Say Never," and here I am 25 years later still excited about this wonderful woman and her music. Iyall started Romeo Void with fellow San Francisco Art Institute student Frank Zincavage in 1979 and the band was quickly signed to Howie Klein's independent label 415 Records, "the first North American record label devoted to new wave music." Romeo Void went on to be the most successful band on the label and following the success of 1981's It's a Condition 415 partnered up with Columbia Records for one of the very first independent/major label collaborations. Romeo Void recorded four albums - It’s a Condition in 1981, Benefactor in 1982, the Never Say Never EP (1982), and Instincts in 1984. "A Girl in Trouble (Is a Temporary Thing)," from Instincts, went to #35 on the Billboard Hot 100. Greil Marcus, at the time writing for New West magazine, praised Iyall "as one of the most exceptional artists to emerge from California’s new wave scene." Romeo Void broke up in 1985 and Debora Iyall went on to make one "solo album for Columbia, Strange Language, in 1986. She’s assembled numerous bands through the years and played venues on the West Coast in San Francisco, Joshua Tree, Los Angeles, and Portland." Iyall earned her "Master’s Degree in teaching in 2007 and has supported herself teaching art since the mid-90s." And now, the unique voice that is Debora Iyall has returned with Stay Strong, an 11 song album marked by her passionate vocals and provocative lyrics. From Debora Iyall: Stay Strong is a collaboration with Peter Dunne, her songwriting partner since the early 90s. On the album Iyall’s singing and lyrics and Dunne's playing and production take an honest and imaginative direction. Iyall explains, "It's a natural extension of the work I've done over the years. Peter has a way of intensifying the feeling of the lyrics with the tones and colors he brings to our songs." Iyall is still exploring heartache, frustration and love gone wrong, but her optimism shines through even on the darkest tracks, with Dunne's music adding to the album's bright aura. The duo came to their sound organically writing some of the songs together in Dunne's studio over the years and then adding to the catalog with new songs written since last fall. The rock and dance beats are still there, but both artists are interested in branching out and expanding their creative reach. Dunne's wide-open soundscapes include subtle touches of reggae, trip-hop, blues, hard rock and classic late night musical reverie, but it's still an unabashed pop album. "I grew up loving pop," Iyall says. "Working with Peter helps me stretch. To complement his inventive melodies, I grew as a singer on every song." Although Iyall has been keeping a low musical profile for the past few years, she hasn't been forgotten by her fans or her peers. Frank Black, John Doe, Dave Wakeling, Martha Davis, Terri Nunn, Jello Biafra, Translator and Wire Train have all invited her to participate in shows in the past few years. At these shows, the response to the material that Iyall and Dunne have written for Stay Strong has been remarkable. "Looking out at fans singing along to a brand new song at a show has a powerful effect on me. I'm all fired up to embark on a new era. I've always loved being on stage and now that I have new songs to sing, I can’t wait to get back to performing." 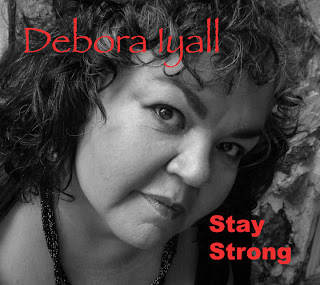 Stay Strong is available in CD format at deboraiyall.com, with plans for digital downloads to follow.